In a surprised move, President Uhuru Kenyatta and his political rival Raila Odinga, the leader of National Super Alliance (Nasa) on Friday held a meeting at Harambee House in Nairobi. 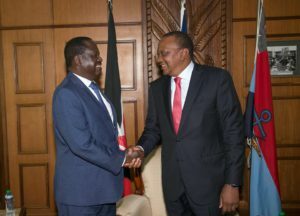 On his twitter account, Kenyatta posted saying he was pleased to have hosted “his brother” Raila Odinga to Harambee House,where they had an opportunity for extensive discussions. “We have come to a common understanding, an understanding that this country of Kenya is greater than any one individual,” Kenyatta stated. The meeting was the first face-to-face, after falling out many years ago. Odinga contested against Kenyatta last year and he lost. He went to court to challenge the results and the court ruled in his favour, ordering for fresh elections, which Odinga boycotted. After Kenyatta was declared winner in the elections, Odinga later organised mock self-inauguration, attended by thousands of supporters at Uhuru Park. The Kenyas government arrested some Nasa leaders over involving themselves in the mock swearing in ceremony. In a joint statement issued on Friday, the two leaders said the agenda of the meeting was to unite and heal Kenya. They promised to work together to halt the country’s descend into the abyss following a divisive 2017 General Election. According to the statement, Kenyatta and Odinga said they are ready to put aside their differences and reconstruct a nation that is responsive to the urgent need for prosperity, fairness and dignity for all Kenyans. Reading the statement, Odinga said despite all the reforms, they continue to have a deep and bitter disagreement. “Ethnic antagonism and divisive political competition have become a way of life,” he added. The leaders during the meeting agreed to roll out a programme to effect their shared objectives. This will revolve around the fight on corruption divisive elections and lack of national ethos, among others. “Elections come and go but Kenya remains. Our future must not be dictated by the forthcoming coming elections, it must be dictated by the goals of the country. We shall start a process of bringing of our people together, and find out what really divides our nation,” Odinga explained.